Soft’N Stretch™ fabric sleeve positions a soft Gel pad to protect metacarpal heads. 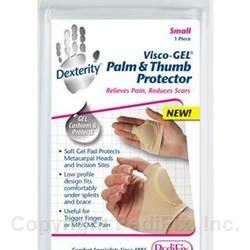 Use to cushion the base of the thumb or incision sites. Low profile design fits comfortably under splints and braces. Ideal for ‘trigger finger’. 1 per package. Wash and dry affected area. Slip over third finger and position over the upper palm or slip over thumb, position as needed. Remove for 3-4 hours a day to allow skin to breathe. Hand wash, rinse thoroughly. Press flat in a towel to remove excess moisture. Air dry completely before reuse. Sprinkle with talcum powder if gel becomes tacky.